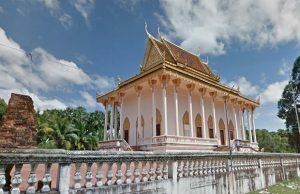 Preah Theat Teuk Chhar is a group of temples in Thmo Da village, Beung Nay commune and Thmei village, Krouch commune in Prey Chhar district, about 39 kilometers from Kampong Cham provincial town. 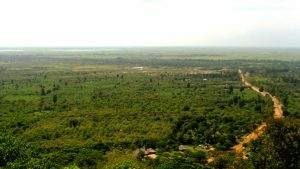 Visitors can reach Preah Theat Teuk Chhar by taking National Road 7 from Kampong Cham, turn right at the provincial road and drive 13 kilometers before turning right again and driving another 5 kilometers along a canal trail, to the temple site. 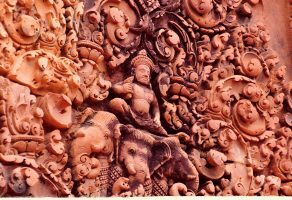 The temples were constructed in AD 1005, during the reign of King Suryavarman I. 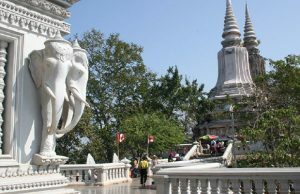 As proposed by King's adviser Chung Chheal (also named Chekngak Khealleah or Leaksintra), the King agreed to build these temples, and Leaksintra started construction on the site called Sithiborya that which owned by the King, who also contributed money. Leaksintra, however, used his salesmanship to encourage the local people to contribute money as well, until the project was finished. One of the temples houses a Shiva lingam named Sreipatresvara, and two divinity statues called Paramesvara and Sarasvata at both sides. Another cavelike temple believed to house a god is located along a canal, near a waterfall. Badly damaged over the years, only one door frame remains today, and it is overgrown with vegetation. The architect excavated a large pond on the right side of the temple called Leaksintrada. A golden Silva lingam was kept in the middle of the pond. Nearby, a village of wealthy people was formed. In addition, people from nearby villages were invited to live there, too, and the village soon became a crowded but cheerful town. Leaksintra told the king of the new town, and the king went there to celebrate the town's inauguration in AD 1025. He gave the city numerous gifts, including 29 soldiers and a rice field that surrounded the temple. He had ponds dug and a huge court built for festival celebrations, and he gave decorations for the temple. He named the site Leaksintrabot in honor of its architect, Leaksintra. Later, the site became a place for religious worship. The religions practiced changed from king to king. Some kings practiced Brahmanism, while some practiced Mahayana Buddhism. Others were Theravada Buddhists, which explains why there are so many small temples at Preah Theat Teuk Chhar. All told, there are 551 small temples which are influenced by Brahmanism and Buddhism.Some of the temples contain statues of heroes who gave their lives for the nation. Many of the temples were destroyed by years of war. Others were heavily damaged. Today, monks and visitors to the site search in hopes of finding the name and foundations of these temples so they might be rebuilt. Some temples have been rebuilt already, their wood and tile roofing replaced with concrete.